Ellis revealed: “It’s a hard one to swallow really. We’ve given it everything but just run into a Workington team who are phenomenal around their own track. “Obviously we’re all gutted for the club and the fans. It’s devastating to come all this week and come away with nothing to show for it. .“We had a home advantage just as good as theirs so it would have been much closer, I’m absolutely sure of that. “We also had the rain come down in the first leg of the Championship final which perhaps cost us a bigger lead as well when it was rained-off. Richard Lawson then had to fight for four laps to pass home youngster Kyle Bickley but the home side were well in control and 14 points up after a Heat 8 maximum. Finally the Comets put the Hammers out of their misery with a 4-2 in the next race over Adam Ellis to secure the Shield success. Mason Campton 12+1, Rasmus Jensen 12, Nicolai Klindt 10+1, Rene Bach 8+3, Kyle Bickley 7+1, Stefan Nielsen 3+1, Ty Proctor r/r. 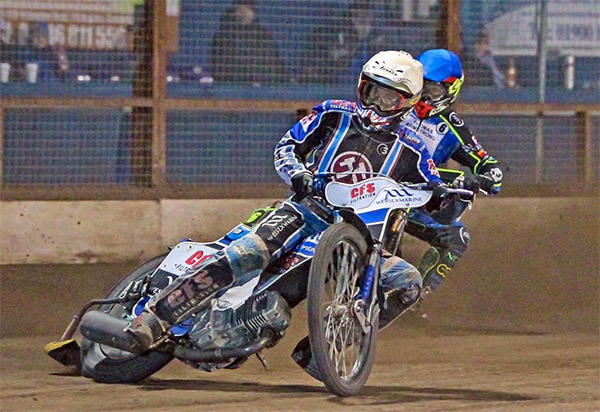 Nick Morris 12+1, Richard Lawson 10+1, Adam Ellis 9, Kyle Newman 4+2, Alfie Bowtell 1+1, Zach Wajtknecht 1, Ben Morley 1. The second meeting in this double header – the last league meeting of the year – was abandoned after four heats and the result will not stand.